Hubby has raised this issue a number of times and well, I don’t know. It’s not that I don’t want to move to Cape Town, I do, but Port Elizabeth is my home. I love Port Elizabeth, I love living here, I love the people here, I love my job (believe it or not), and I love the fact that Baby Girl will be going to such a good school next year – St Dominic’s Priory. And I love that I need both hands to count the number of families with only children here in our social circle and with friends at her school. Baby Girl is not alone and she is not the only “only” child in our circle of friends. In fact, I can just off the cuff think of at least 6 or 7 families with only children. That will be a confirmation to her one day that all is okay and that being an only child is quite the norm. I love that we don’t battle with traffic issues and I love the social life we have in P.E. We all get together at each other’s homes and braai and do wine club or whatever – its relaxed and its social. However, I have always said that I don’t want to live my whole life in one little part of the world – I would love to live somewhere else. But, given my less than stellar adjustment to motherhood and the lack of sleep that it all brought about (of course there are many other issues at play – read all about it here and here), I am totally nervous about moving so far out of my comfort zone. And it’s not that I don’t want to go – for all the reasons above, I want to stay in Port Elizabeth, but it would be so nice to try something new. And although hubby and I agreed that we will only move to Cape Town if we can stand on our own financially, I can’t stop thinking about it. In my daydreams, I think about us spending weekends at Franschhoek, or going to the wine farms for a lunchtime picnic, or hiking up table mountain, and Baby Girl spending time with her cousins who already live in Cape Town. 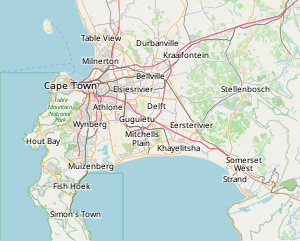 But the reality will probably be far from my lovely daydream fantasies, and having read somewhere that up to 700 families are moving to Cape Town each month – all looking for jobs and schools and places to live, it may not be so easy to even consider such a transition. A lady whose job I took over moved to Cape Town at the beginning of last year – it took her just over a year to find work. I can’t afford to not work for a year. And homes, schools, etc are all far more expensive there. And I suspect that hubby’s sister may resent my presence there, which will make things very uncomfortable for me and for hubby. We get on much better when there is distance between us. And lots of it. And yet, I still can’t stop thinking about it. I’m also afraid that hubby will get caught up in cycling and mountain biking, and I will be left to figure out the vast city by myself. Not that I couldn’t do it, but I think I’m more afraid that it will cause a rift in our relationship – and yet, it could also be an amazing adventure that could strengthen our relationship as we discover a new place to live, new places to visit and new little routines that we could make our own. Every time they advertise a job internally through our company, I always check to see if it is something I could apply for in Cape Town. I doubt I’ll be successful, because it’s usually jobs that require a degree in accounting or auditing, which I don’t have. And even though my mother hasn’t been the support I had hoped she would be, she still does help out every now and then. I don’t think hubby’s parents will be up to that – actually, let me rephrase, I don’t think hubby’s sister would allow that. So, that may put us under even more pressure, with less help. It truly does take a village to raise a child. Pingback: Accepting yourself – embracing your life – The Fragrance of Marriage!